Below is a series of articles I wrote for Socialist Voice between September and October 2010 dealing with leftwing and liberal opposition to the Boycott, Divestment and Sanctions (BDS) campaign against Israel. They were published between September and November 2010. I am confident most readers will not need to be convinced of the justness and necessity of the Boycott, Divestment and Sanctions (BDS) campaign aimed at forcing the rogue state of Israel to comply fully with international law and respect the full human, civil, political and national rights of the Palestinian people. However, there remain those – groups and individuals – on both the ‘hard’ and ‘soft’ left that, for a variety of reasons, refuse to support the BDS campaign despite being supporters of the Palestinian struggle for justice. The first thing to be said about BDS is that it is not an invention of Western ‘do-gooders’, it is what the Palestinian people – through their worker and civil society organisations – have called on internationals to engage in. Who are we, living 1000s of kilometres away, to say “actually, we know better”? It is not we who have suffered the brunt of Zionist-Israeli violence, occupation and colonisation for more than six decades. The call, issued five years ago, comes from the oppressed, and we should respect and observe it, and do all in our power to build the BDS campaign in this country. I would like to deal first with the ‘soft’ left, wherein the main counter-argument to BDS runs something like “we cannot boycott one side in this conflict, we need to respect both sides and encourage them to resolves issues through dialogue”. There are a two false assumptions inherent in this reasoning – at least for anyone who is serious about Palestinian obtaining their freedom. The first is the idea that there are two more-or-less equal parties in this “conflict”. In fact, on one side there is an oppressive colonial state with the fourth largest army in the world, which enjoys the overt support of US imperialism, the complicity of the EU, and the tacit support of the UN and various corrupt Arab regimes. On the other side there is an oppressed colonised people, badly armed with little meaningful international support aside from civil society campaigns, terrorised, brutalised and humiliated on a daily basis. We do not need to “respect” the brutal oppressor in this equation, indeed, it deserves only our contempt and we should do all we can to help defeat it. The second false assumption is that Israel negotiates in good faith, when history has shown the exact opposite. A mere example: during the so-called Oslo “peace process” years, illegal Israeli colonial settlements doubled in a clear violation of the terms of Oslo. As far as Israel is concerned, currently negotiations serve as nothing more than a fig-leaf while it busies itself with creating “facts on the ground”. Israel would be more than happy to endlessly “negotiate” until there are no Palestinians left in Palestine! Of course, for reasons outlined above and more, Israel can act this way because it enters negotiations from a position of power while the Palestinians enter from a position of relative weakness. Capitalist states do not act “out of the goodness of their hearts”, they act in their own self interest and thus to expect such a powerful state to cede anything meaningful to a weaker adversary is absurd. This is why, if one accepts – as most soft-leftists do – that only talks can provide a genuine road to a just peace, then there must be some degree of parity between the negotiating parties. 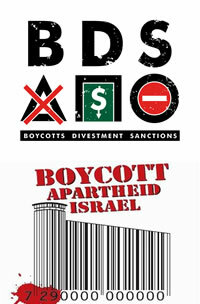 BDS offers us – international civil society – the means to help achieve this parity. BDS enables us to pressure the Israeli state to show that its actions have repercussions internationally and that it is no longer acceptable for it to act as it does. BDS aims to isolate and weaken Israel, and as a corollary, strengthen the hand of the Palestinians. On this basis it is logical that BDS can play only a positive role in laying the groundwork for future genuine negotiations on a more-or-less level playing field, as thus far “negotiations” and “balance” have only produced further colonisation and imbalance. Without BDS, negotiations are essentially pointless. 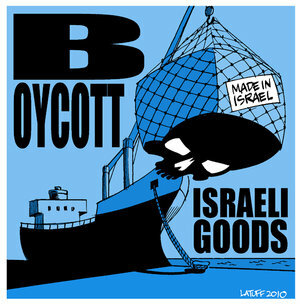 It is often argued that the boycott campaign will hurt “good Israelis” or “Israeli workers”. To deal first with the former point, the “goodness” or otherwise of any given individual Israeli is irrelevant to the campaign. The boycott’s target is the Israeli state – and while the state governs a society made up of individuals, it is also the apparatus via which Palestinians have been oppressed, colonised, murdered and ethnically cleansed. As long as the state is Zionist-colonialist in outlook and practice, it will be the target for boycott. The aim is that all Israelis, “good” and “bad” alike, will realise that it is not in their individual or collective interest to be part of an Apartheid state that is shunned by the world and that steps toward the reforming of the exclusivist-supremacist state will begin from within. Being determines consciousness, and one thing is certain, existing in a state where there are no repercussions for outrageous action will never lead people to re-examine commitments to Zionist-colonial fundamentals. To quote Israeli journalist Gideon Levy, “Israelis don’t pay any price for the injustice of the occupation, so the occupation will never end”. As regards specifically Israeli workers for whom it is sometimes argued, the boycott “drives into the arms of the ruling class” – while one shouldn’t fall into the trap of viewing the Jewish-Israeli working class as a single homogenous ideologically immovable reactionary bloc, an objective look at the reality on the ground will show that these workers vote overwhelmingly for parties of the right – including the Labor Party. The only major non-Zionist working class party in Israel, HADASH, gets the overwhelming majority of its votes from Palestinian citizens of Israel. The unfortunate fact is that Jewish-Israeli workers are already in the blood-drenched clutches of the ruling class. In theory it is fine to suggest – as some far left groups do – that these workers “have more in common with the oppressed Palestinian masses than their own capitalist class”, and that a common struggle be waged against Israeli colonial-capitalism. In the short-term, unfortunately, this is unlikely to happen. While there are of course class divisions in Israeli society – some of them acutely sharp – Palestinians cannot afford to sit around waiting for the magical day when Jewish-Israeli working class wakes up and decides to throw off the shackles of Zionism and embrace their Palestinian brothers and sisters. In addition, BDS is being endorsed by small but growing radical sections of Jewish-Israeli society. Organisations such as Boycott From Within, the Israeli Committee Against House Demolitions, the Alternative Information Centre as well as individuals like Ilan Pappe, Neve Gordon and Yitzhak Laor have fully endorsed the Palestinian call for BDS, while others have embraced limited aspects of it. It is clear that the Israeli state view even these small developments with alarm as there are now laws being drawn up to criminalise Israeli BDS activists. This is an utterly false dichotomy. Of course no one in the Palestinian solidarity movement would argue against trade union boycotts – indeed we continually argue in favour of such action, were enthusiastic in our support for the dockers’ actions and hope they can be built upon and expanded – or argue against their effectiveness, as they stop Israeli goods at source. Counterposing the two is pointless and elitist, ignoring as it does that most of those who “individually” boycott Israeli products are workers themselves. It also ignores the fact that the dockers’ actions were not the result of some spontaneous awakening, but argued for by activists who have been promoting and laying the groundwork for BDS since 2005. Boycott has to start somewhere – in this country it started on the streets and has grown to include the trade union movement. ICTU passed a boycott resolution in 2007 and is now initiating a consumer boycott awareness campaign amongst its member organisations. Of course, this is far from the optimum action trade unions can take and Palestinian solidarity activists – especially those in the trade union movement – should continually push for stronger action, but it is a start and should be welcomed. All advances in the boycott campaign, whether they come from individuals, trade unions or indeed among the business community, are welcomed by Palestinians and they should be welcomed by those of us who stand in solidarity with them. To end on a question, if “individual” boycott actions are so “ineffective”, then why is the Israeli state and its international operatives also seeking to criminalise consumer boycott actions and activists? Sporting & Cultural Boycotts – The most common refrain of argumentation in opposition to this is that “sport/culture and politics do not mix”. Anyone who was involved in the South African anti-apartheid campaign will know this is nonsense. It is through sport and culture that states most often present their “acceptable faces” to international audiences. Indeed, the Israeli Foreign Ministry makes no bones about this and openly promote what they call “Brand Israel” as the liberal face of a brutal occupation that denies Palestinians space for their own cultural and sporting expression. At a recent Israeli Embassy hosted dinner before the Irish and Israeli women’s soccer teams played each other, Embassy staff distributed disgusting anti-Palestinian propaganda that attempted to link Palestinian resistance to the Holocaust. As the Israeli state actively uses sport and culture to legitimise apartheid, we should have no qualms about using boycotts to highlight this apartheid. Academic Boycotts – It is often argued that an academic boycott would “limit free speech and exchange of ideas”. It does no such thing – the Academic Boycott is not aimed at individual academics, but at Israeli academic institutions which themselves form an important part of the matrix of oppression by maintaining, defending or otherwise justifying apartheid policies. Meanwhile, Palestinians enjoy no semblance of academic freedom, not even the freedom to travel to school unhindered. Divestment – The opposition to campaigning for businesses to divest from Israel stems from the basic idea that it is pointless to ask capitalists to “be nice”. Actually the aim of the divestment is to make it unacceptable for companies to invest in Israel. 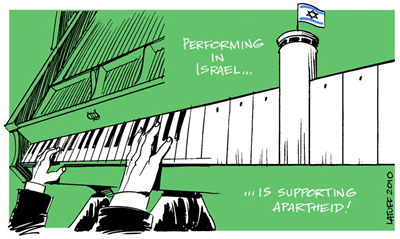 Israel craves legitimisation and to be perceived as a normal “Western” state – the divestment campaign argues that the exact opposite is true and that companies that invest there are in fact complicit in propping up an apartheid system. Indeed, some companies – such as the Irish firm CRH whose cement is used to build the Wall and illegal colonial settlements – are directly complicit in the commission of serious violations of international law. Successful divestment campaigns serve to increase the pressure on Israel and those companies that continue to invest there. Unfortunately, at present we live in a capitalist world, but if we can make it taboo for capitalists to do business in Israel then that is a point of attack we cannot afford to dismiss. It doesn’t make one pro-capitalist to see the value in this. Sanctions – “Asking capitalist governments to change their self-interested policies is pointless” is the most common claim made about campaigning for sanctions. But then what is the point of any form of social struggle that aims to win reforms from the capitalist state? Using such logic, all demands made upon the state by political and protest groups are basically a waste of time. Of course, capitalist states never simply grant reforms out of generosity – they are pressured into concessions by social movements. The aim of the sanctions campaign – as it was with the South African campaign – is to make it politically and socially unacceptable for any government to be seen to be pro-Apartheid. Part of this campaign involves meeting with politicians and part of it involves building support on the streets and in society for the BDS campaign – the two strands are not mutually exclusive, in fact they are deeply intertwined. Finally, to those who maintain that the BDS campaign is “ineffective”, perhaps they should look at the Israeli state and its international lobby groups’ reaction to the growing threat of BDS. Just last week pro-Zionist groups in the US launched a $6 million anti-BDS initiative. In Israel BDS activists are being criminalized, while in February the Reut Institute, a think tank close to the Israeli government, called on Israel to “sabotage” and “attack” the BDS movement. At the very least, we are doing something right – we have them worried! This entry was posted on January 14, 2011 at 12:56 am and is filed under bds, boycott, capitalism, corporations, gaza, Goldstone Report, IPSC, Ireland, Ireland Palestine Solidarity Campaign, israel, marxism, palestine, sanctions, socialism, west bank, zionism. You can subscribe via RSS 2.0 feed to this post's comments.